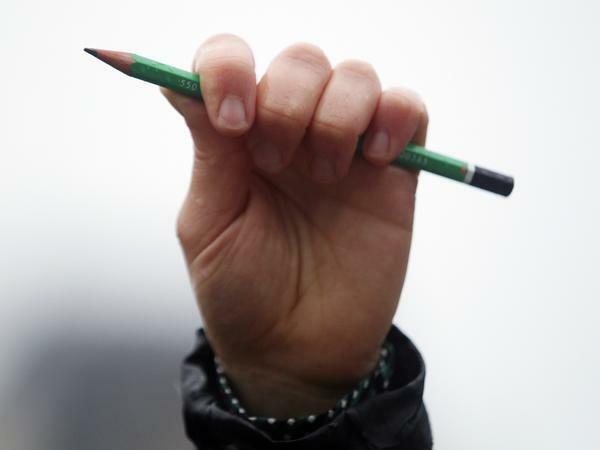 A man holds a pencil in the air during a minute of silence in Paris on Thursday for the cartoonists and other victims of gunmen on the offices of French satirical newspaper Charlie Hebdo. But this week, with the targeted killings of the cartoon satirists of Charlie Hebdo in Paris, we were reminded how dangerous people with no sense of humor can be. The Onion ran a headline: "It is Sadly Unclear Whether This Article Will Put Lives At Risk." Kelly Leonard of The Second City theater, which lampoons politicians, celebrities, and faiths of all kind, told us, "We have proudly framed our hate mail and put it on display in our lobby for decades. Today, those tiny acts of subversion feel so benign. The atrocities that have occurred in Paris send a collective chill down the spine of anyone speaking truth to power through laughter." A lot of historians see language or tool use as signs of civilization. I'd like to add: a sense of humor. Laughing at ourselves. I find it telling that Shakespeare, Socrates, Lincoln, Churchill, Salman Rushdie, could all be funny. Did you ever hear a good joke from a tyrant? Many people look for art and culture when they travel. I like to find the jokes, especially in places so grim people can be punished for laughter. I remember all the Russians who whispered that a man had been arrested in the Kremlin for shouting, "The premier is a fool!" — because it revealed a state secret. I remember people in Iraq under Saddam Hussein who used to ask, "What country is bigger — China or Iraq?" "China, of course," but an Iraqi would lower his voice to ask, "Ah, but what if you count all the statues of Saddam?" And I remember all the people in Sarajevo who told jokes about grisly things because that's what surrounded them; they needed to laugh as much as they needed to eat and breathe. Simon Schama, the historian and writer, told us this week that heresy is a right. "Irreverence is the lifeblood of freedom," he said. "We plainly now have an urban war between civil society and its enemies. But how do we protect that civil society without killing off the freedoms we want to sustain. That's the discussion that must now be had." Then he quickly added, "Hate that over-use of the word conversation. It's as though 'argument,' 'debate,' 'discussion,' etc., has become too abrasive." I looked at a dozen of the Charlie Hebdo cartoons about religion, including rabbis, imams, and the pope. I might argue with a few abrasive ones that made me squirm. But satire won't always make us comfortable, or even always make us laugh. Murder is easy. Comedy is hard. Satire is a tricky business. The punch lines quickly get stale. The same people who laugh at one joke can get offended by the next. But this week with the targeted killings of the cartoon satirists of Charlie Hebdo in Paris and the murder of people in a kosher grocer, we were reminded how dangerous people with no sense of humor can be. The Onion ran a headline - it is sadly unclear whether this article will put lives at risk. Kelly Leonard of The Second City theater, which lampoons politicians, celebrities and faiths of all kind, told us we have proudly framed our hate mail and put it on display in our lobby for decades. Today, those tiny acts of subversion feel so benign. The atrocities that have occurred in Paris send a collective chill down the spine of anyone speaking truth to power through laughter. A lot of historians see language or tool use as signs of civilization. I'd like to add a sense of humor, laughing at ourselves. I find it telling that Shakespeare, Socrates, Lincoln, Churchill, Salman Rushdie, could all be funny. Did you ever hear a good joke from a tyrant? Many people look for art and culture when they travel. I like to find the jokes, especially in places so grim people can be punished for laughter. I remember all the Russians who whispered that a man had been arrested in the Kremlin for shouting the premier is a fool because it revealed a state secret. I remember people in Iraq under Saddam Hussein who used to ask what country's bigger - China or Iraq? China, of course, but an Iraqi would lower his voice to ask ah, but what if you count all the statues of Saddam? And I remember all the people in Sarajevo who told jokes about grisly things because that's what surrounded them and they needed to laugh as much as they needed to eat and breathe. Simon Schama, the historian and writer, told us this week that heresy is a right. Irreverence is the lifeblood of freedom, he said. We plainly now have an urban war between civil society and its enemies, but how do we protect that civil society without killing off the freedoms we want to sustain. That's the discussion that must now be had. Then he quickly added hate that over-use of the word conversation. It's as though argument, debate, discussion, etcetera, has become too abrasive. I looked at a dozen of the Charlie Hebdo cartoons about religion, including rabbis, imams, and the pope. I might argue with a few abrasive ones that made me squirm, but satire won't always make us comfortable, or even always make us laugh. Murder is easy. Comedy is hard. Transcript provided by NPR, Copyright NPR.